A World-Renowned Gynecologist's Solutions for a Better World in Women's Health Care "
Dr. Townsend Speaks To Women . . .
family members, women have always played an integral part in my life. consultations, examinations and operations, I have realized that women are nothing less than remarkable creatures. their doctors could and should do better." "I don't mind being called controversial. You might say I've earned the right. To me, controversy is nothing more than knowledge in the making. For more than forty years, I've run the full gamut in gynecology and witnessed the deterioration of the American health care system... and I'm not afraid to say so! More over, because I've made it my business to pay my dues as a physician, I can openly demand a mandate for change. characterized by caring and qualified physicians has turned into a depersonalized, political empire drive by power and greed and controlled by Corporate America. Unfortunately, you have taken the brunt of this medical mania. You have suffered the abuse of a health care system that has become narrow minded, HMO manipulated and pharmaceutically dominated. "Slow to change and sadly subjugated, physicians need to redefine themselves as true health care providers. How they relate to women's disorders is a great place to start. The rising cost of health care, coupled with indifference to or even disdain for treatments not brokered by pharmaceutical reps or authorized by HMO's, has limited women's choices. In too many cases, the persistent trust women have placed in their primary care providers and gynecologists has been rewarded with confusion and mediocrity. "Scores of women undergo unnecessary surgeries and take untold amounts of minimally effective prescription drugs. In addition, many doctors, because of toime constraints imposed by HMO's, often skate lightly over their patients' symptoms or dismiss them altogether as psychological disorders. Doctors, we can't claim ignorance! There is clearly enough available data supporting safe and effective therapies that can significantly reduce the incidence of cancer, cut heart disease in half, decrease Alzheimer's, slow aging, lessen the miseries of PMS, substantially reduce the billions of dollars spent on unnecessary drugs, and squarely tackle the homonally driven health problems unique to women. Complementary medicine is taking hold with or without you. The sooner the medical world learns to emphasize a healthy lifestyle, proper diet and specific natural supplements over prescription medications and surgery, the sooner the abgsurd costs of health care will dramatically drop. Why? Becuase we'll all be healthier! "Don't get me wrong. I'm no pushover for using every supplement that claims to be 'natural.' To the contrary, I insist on scientific prooff. Just as I may proclaim my opposition to medical practices that should be abolished, I don't hesitate to expose holistic hocus-pocus. In 'A Maverick of Medicine Speaks To Women,' you won't find lengthy lists of supplemental therapies, unproven treatments for women's disorders or lifestyles that are impossible to maintain. What you will find is my belief that eating a certain way, exercising and using the right nutritional supplements can truly improve your health. "I firmly believe that genetically speaking, we should be living over one hundred years (and healthy years at that). Unfortunately, our dreadful diets, lack of exercise and reliance on pharmaceutical drugs has cheated us out of meaningful longevity and quality of life. For many of us, our senior years are spent with doctors who prescribe enormous amounts of medication, many of which - contrary to what they were designed for - disable us physically and mentally. "As for me, my involvement in alternative medicine has produced a remendous improvement in my overall health. Before discovering the value of alternative therapies, I had already become a cancer statistic. "To say that the medical profession must be revamped is a gross understatement. The ways in which the medical industry supports and polices itself must change. Conversely, you, the women, must learn to make appropriate demands of your doctors; you must stand up to your HMO's; and, you must become innately suspicious, appropriately cynical and self-confident. Then you will be entitled to make the best choices for yourselves. "I want 'A Maverick of Medicine Speaks To Women' to accomplish two things. First, it should motivate and empower women to raise the bar when it comes to their health care. Second, I hope to spur my colleagues to reevaluate their priorities and not be afraid to challenge HMO's (or insurance companies, or whatever governing body is causing them grief). The revolution is on, and I'm on the front lines. 'A Maverick of Medicine Speaks To Women' is the result of decades of personal experience and research. It is a testament to my own commitment to demystify women's health conditions and their viable treatment options. As corny as it may sound, I consider myself an advocate of women - not only my patients, but also the women who work in my profession. I endorse their causes and acknowledge their complaints. to better the health of our patients?" -- Duane E. Townsend, M.D. for a Better World in Women's Health Care." Doctor Townsend attended Medical school was at UCLA where he also received his post-graduate training in Obstetrics and Gynecology. After residency he joined the faculty at UCLA and over the next 4 years he introduced Cryosurgery to gynecology, resurrected Colposcopy, and was the first to train and utilize nurses in the extended role providing cancer screening and family planning. In 1968 he started a mobile cancer-screening program for women dubbed "The Porta Pap Clinic" which continued over 16 years and screened thousands of indigent women for female cancers. in 1986 as Vice chairman of OB/GYN at University of California at Davis. Medical Practice he emphasizes the avoidance of prescription drugs whenever possible through life style changes, alternatives for HRT, the use of natural products for managing many female problems such as PMS, Abnormal bleeding, uterine fibroids, vaginitis etc. 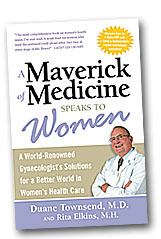 He travels extensively teaching physicians and the public many of the techniques he developed over the past 38 years..
"A MAVERICK OF MEDICINE SPEAKS TO WOMEN"
9 years, Pete Hueseman, R.Ph., P.D.